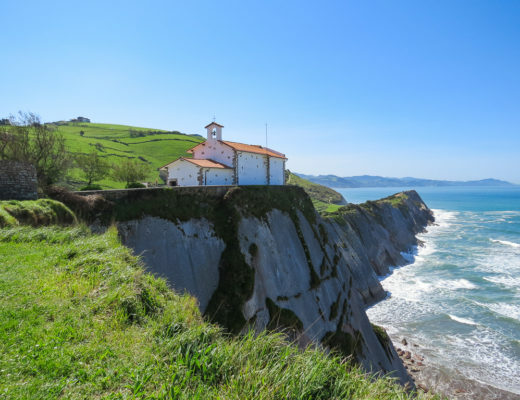 Day-Trips from Naples: Where to Next? - TA TA, CHEERS! This blog post covers my time in Naples, specifically the day trips I took from the city. 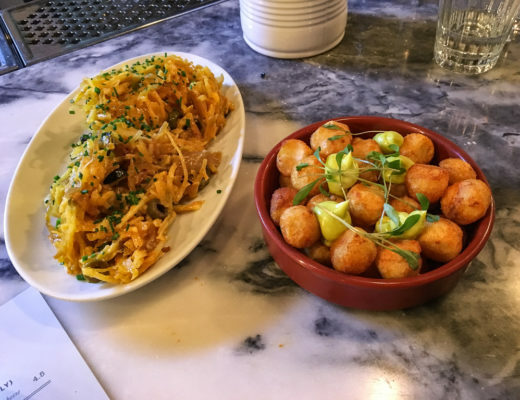 My Italy trip took place in March 2018, where I visited Rome, Naples and the various destinations outlined below. Happy reading! Besides Naples being a fantastic city in itself, it also happens to be a great jumping off point to other parts of the Campania region. Campania is the area in southwestern Italy surrounding Naples. It is rich in culture. 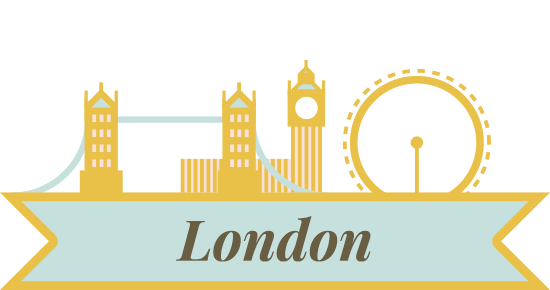 We’re talking about so many cultural elements including gastronomy, music, architecture, and then of course archaeological and ancient sites such as Pompeii and Herculaneum. The name Campania itself is derived from the Latin Campania felix, which translates into English as ‘fertile countryside’ or ‘happy countryside’. It is pretty self-explanatory then why this area has been populated for centuries. 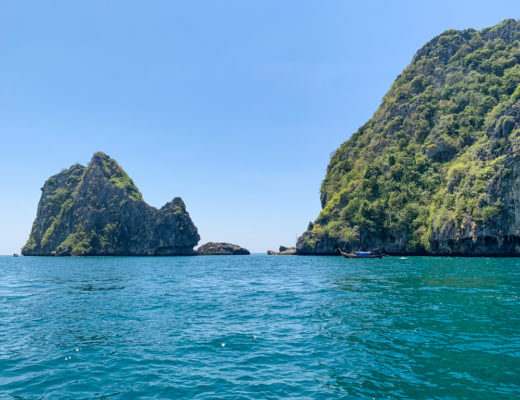 A classic one week holiday, as I came to understand, consists of using Naples as your base, and then spending each day travelling to a different location nearby. You can rent a car, but I can say that the train system in Campania is great! There is something called the Campania Artecard which is actually several different types of cards related to the region. Victor and I bought the 3-day regional pass which includes travel using the UnicoCampania public transport system throughout the Campania region. The card has some other benefits so be sure to check out their pamphlet explaining all the different cards. Below are some of the most interesting places we visited. 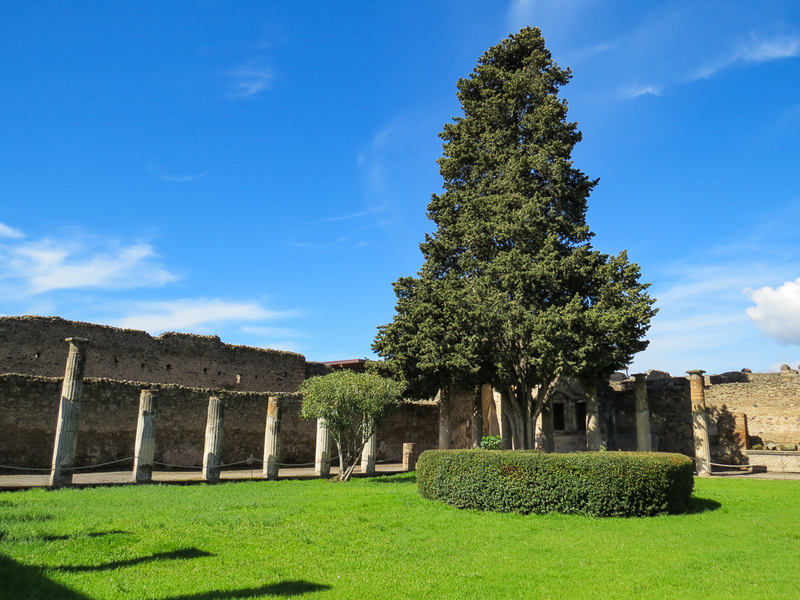 Perhaps the most obvious day trip from Naples is Pompeii. 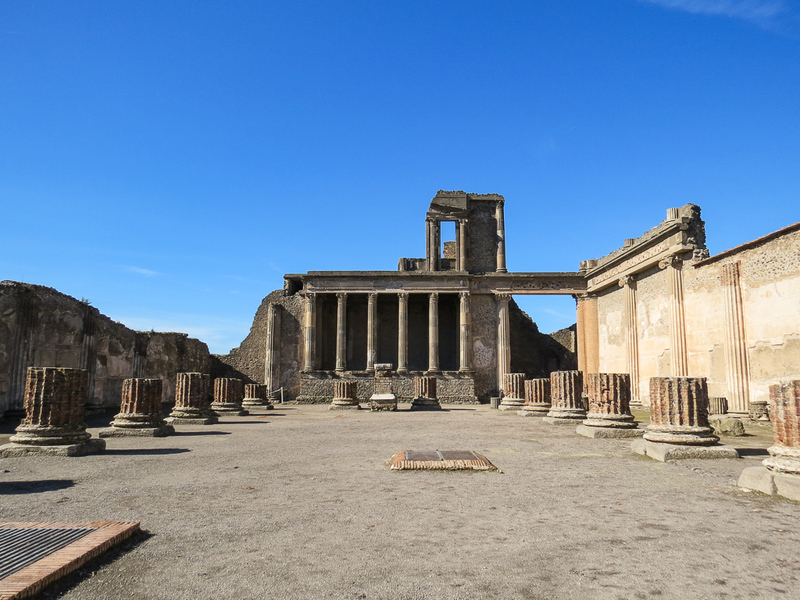 People all over the world know Pompeii because of its devastating story. In 79 AD Mount Vesuvius erupted and buried the town, along with many others, under four to six meters (13 – 20 feet) of volcanic ash and pumice. The town fell into disarray and thieves raided the town over the course of centuries. 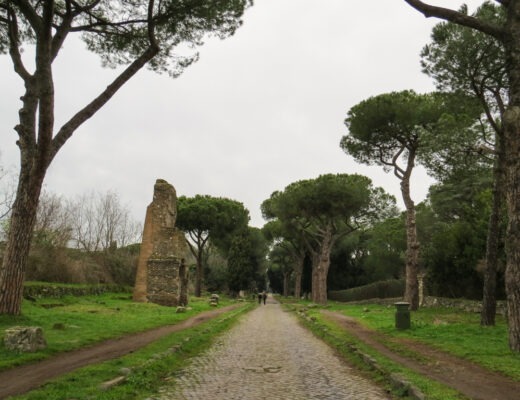 Pompeii remained that way until the nineteenth century when the town was ‘rediscovered’. 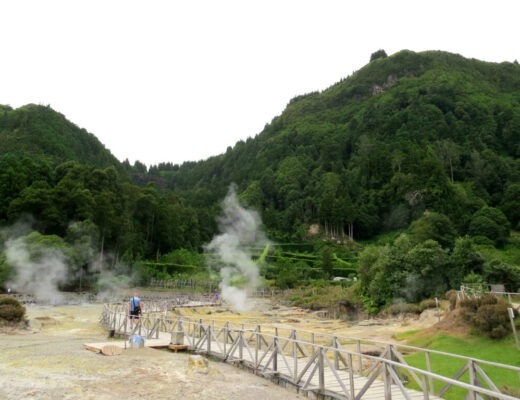 In 1860, Italian archaeologist Giuseppe Fiorelli excavated the site, discovering that there were cavities within the thick layers of volcanic ash. These cavities were in the shape of bodies — no doubt the shells of people running for their lives. 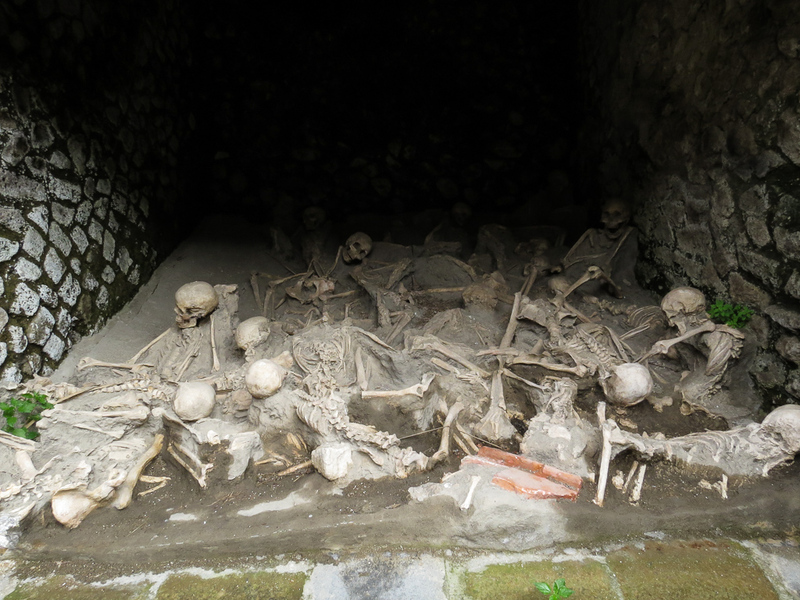 Despite this not-so-positive history, it is still so important to see Pompeii. 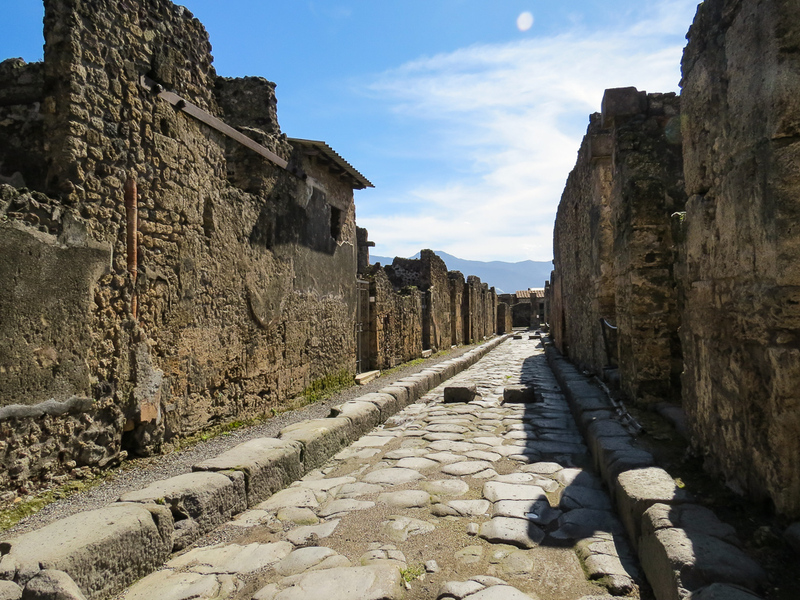 As many of the ruins are still in tact, walking through Pompeii is like stepping back in time. You get see how the Romans lived, and grimly how many died. 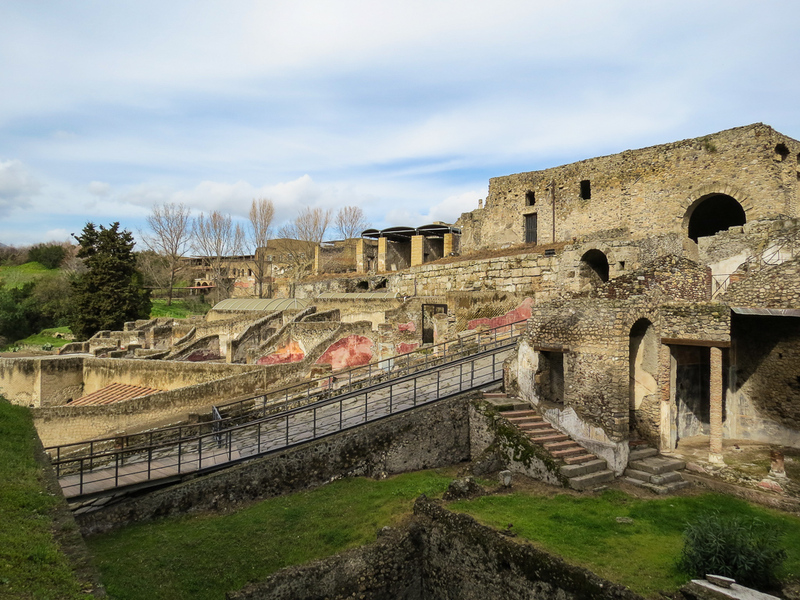 Tackling Pompeii is a bit overwhelming as the archaeological site is massive. A tour or audio guide is absolutely necessary. Victor and I actually used a Rick Steves audio guide simply because we’re not tour people. 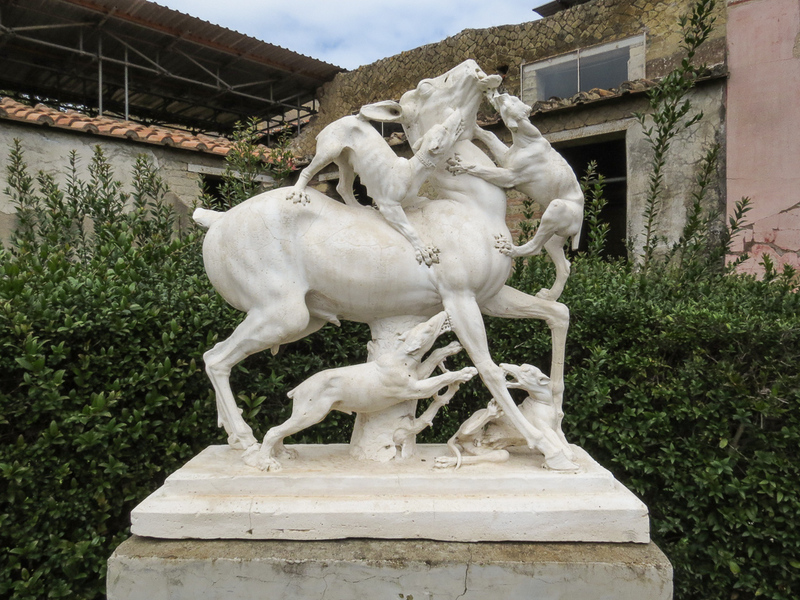 I preface this by saying you must link a visit to Pompeii with a visit to the Naples National Archaeological Museum. 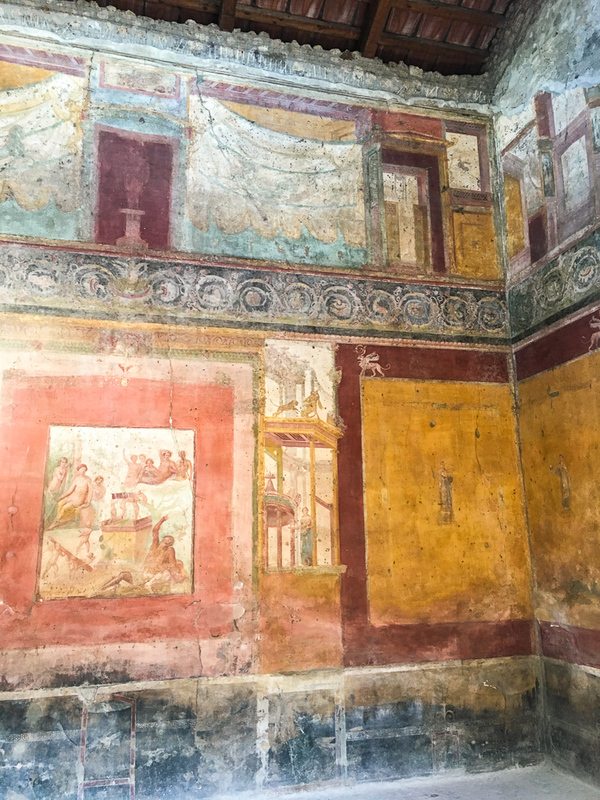 So many treasures in the museum come from ancient sites like Pompeii. 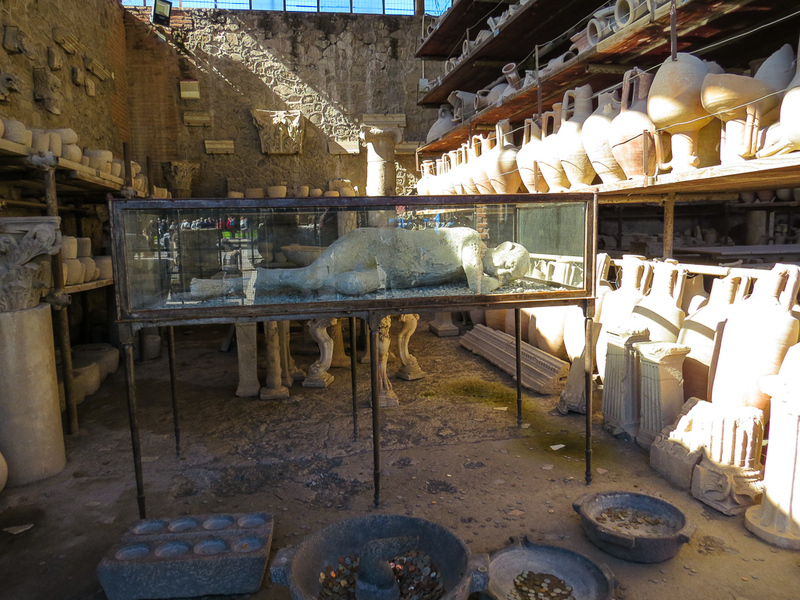 To understand the story of Pompeii, you have to fill in the details from the museum. Now, onto the site! The Forum is the first major area you’ll come across. This would have been the main civic, commercial and religious centre of the city. You can also see Mt Vesuvius looming over the ancient site. 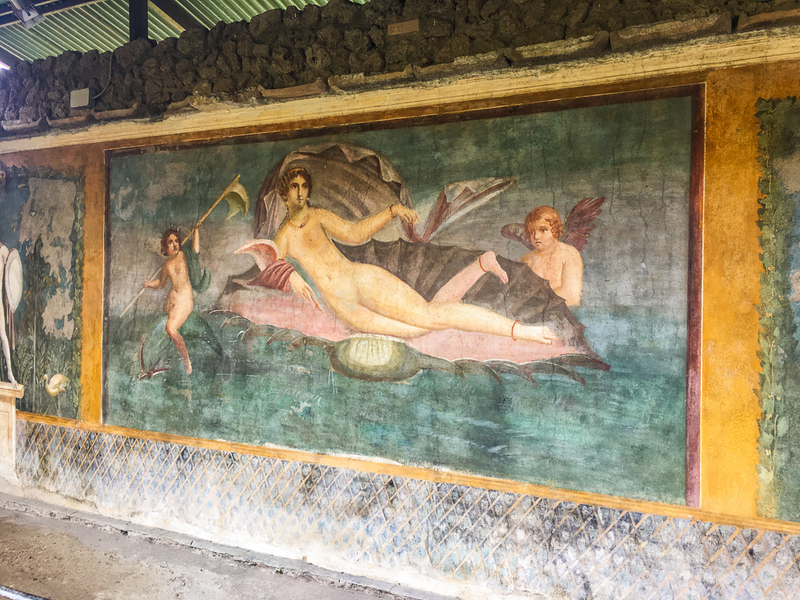 Most of the frescoes are in the Naples museum, however there are some still in tact on the walls in the various villas in Pompeii. 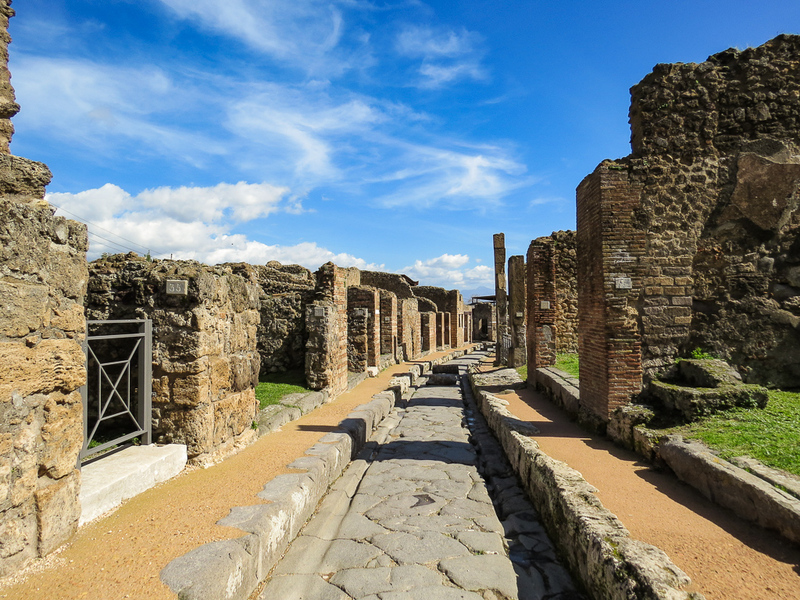 You can spend hours getting yourself lost in the ruins of Pompeii. A lot of people ask me how much time to allocate to Pompeii, but it really depends on who how interesting it is to you! 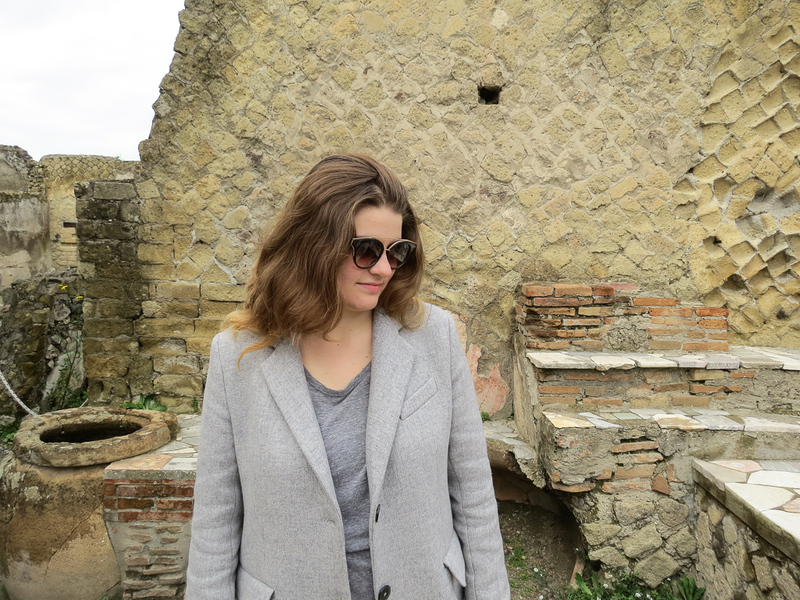 I find it amazing that you could explore Pompeii in just two hours. For us, we explored the area for 5-6 hours. 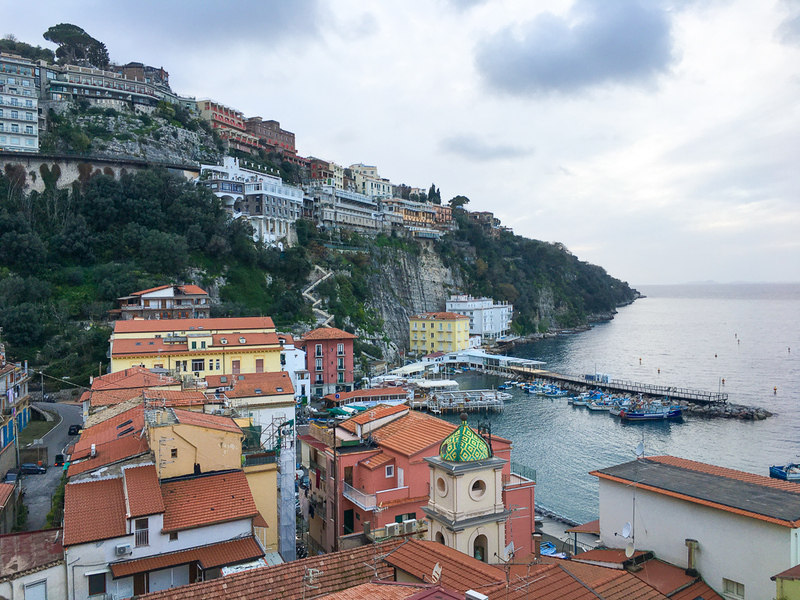 For a complete different change of scenery, we headed to Sorrento! The Amalfi Coast is a beautiful, romantic place which deserves so much more time than just a day. However, if you’d like to just get a taste for this area, Sorrento is your best bet. 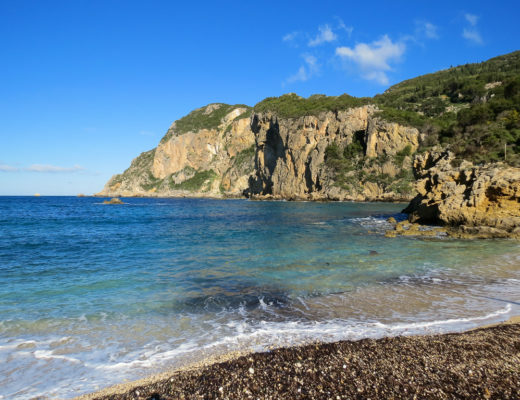 It is a town along the northern part of the peninsula, so it is easy to get to and close by to Naples. You might think a ferry would be the best way to get there, however we found the train along the coast was both faster and cheaper. 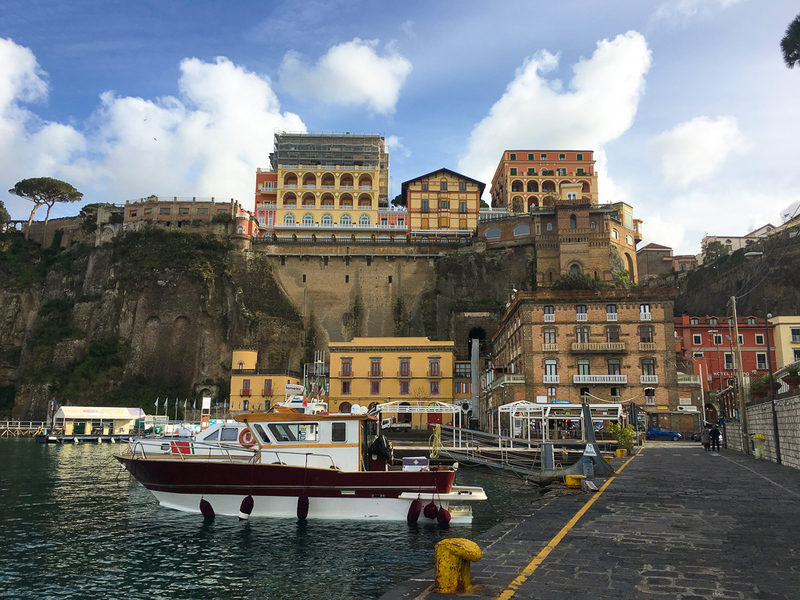 Once you reach Sorrento, head down to the best place to walk around: the harbour. As it is a seaside town, the harbour is developed but also rather lovely. The buildings are quite beautiful, as well as the views. Sorrento can look very different depending on what time of year you visit. Victor and I visited on a relatively cooler, Spring day in March. 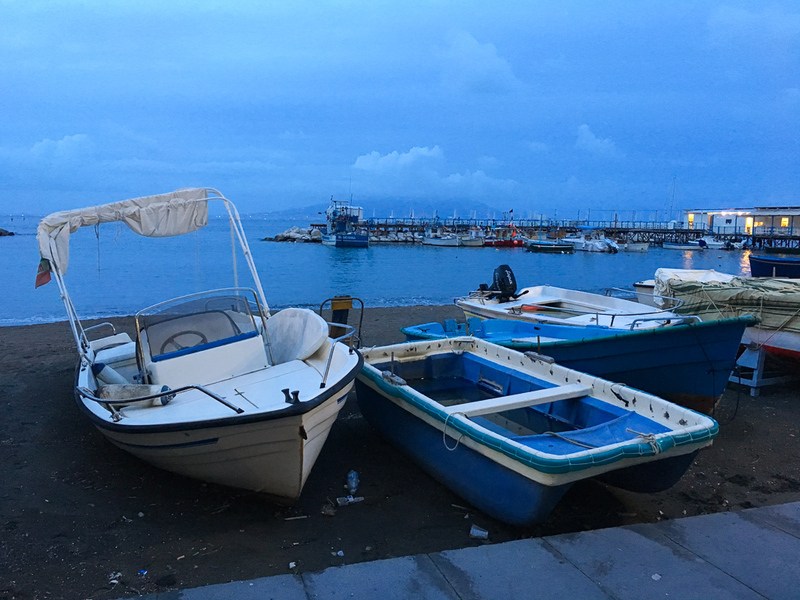 Consequently, Sorrento had not yet fully opened for the season, so it was really nothing more than a quaint seaside town. We just took it easy, from eating gelato to relaxing at a pizza place. You do not really need to do much to enjoy this beautiful town. 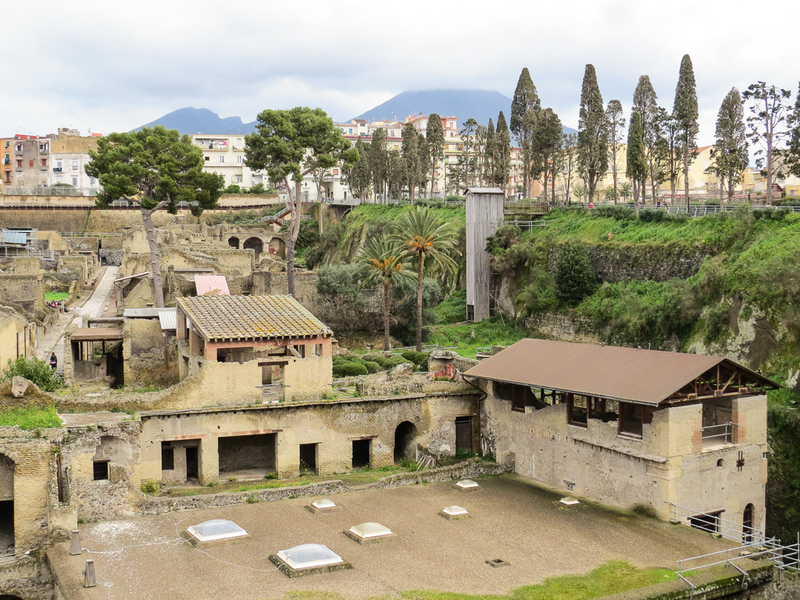 Another important archaeological site is Herculaneum. 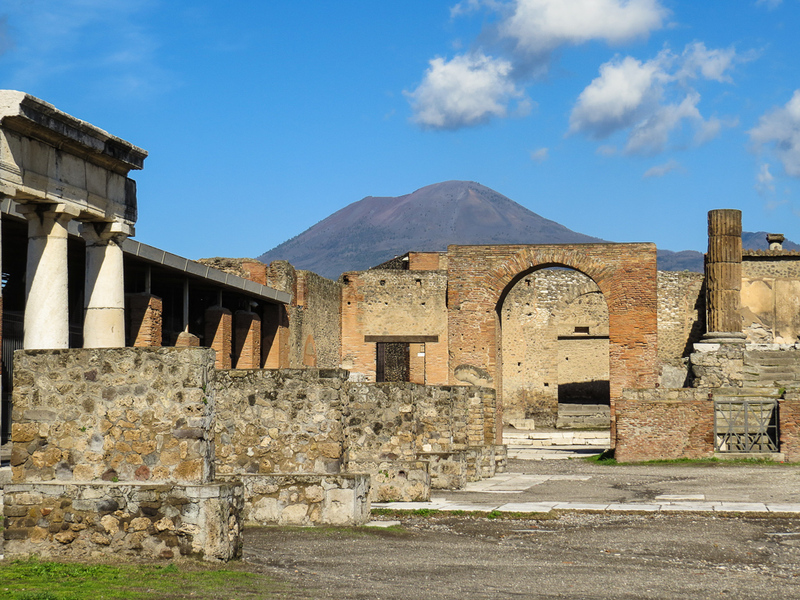 Like Pompeii, Mt Vesuvius had a huge impact on the town. 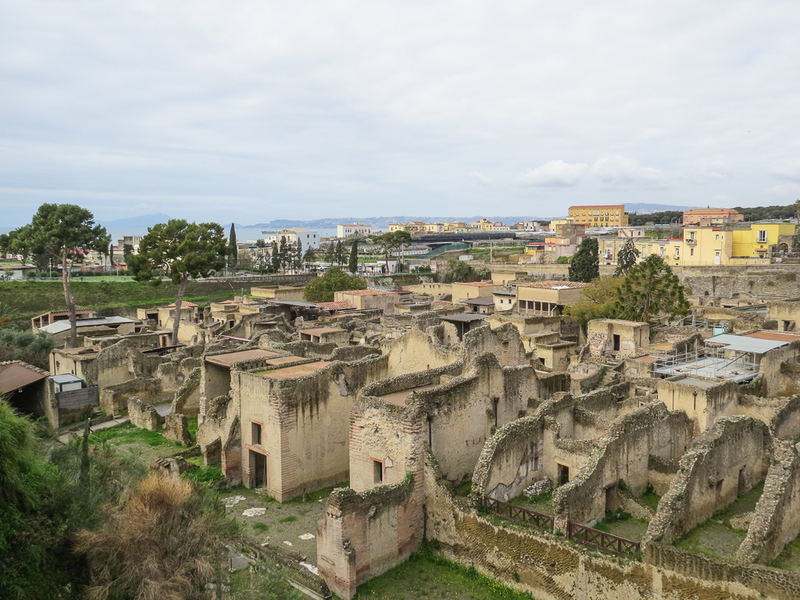 And while the same destruction overwhelmed the town, you can tell even by the ruins that Herculaneum was a very different place. The interesting bit is the placement of the town. It is set on a steep hill, with a sea wall at the bottom. Most of the residents were able to flee the town, though a gruesome discovery was made in 1997, that of 300 preserved skeletons. 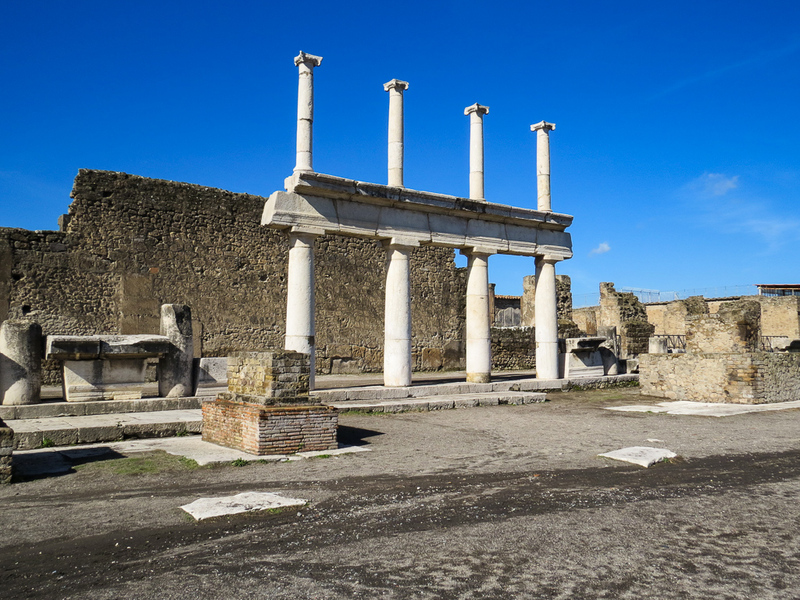 Herculaneum, named after Heracles (Hercules), was a much wealthier town than Pompeii. 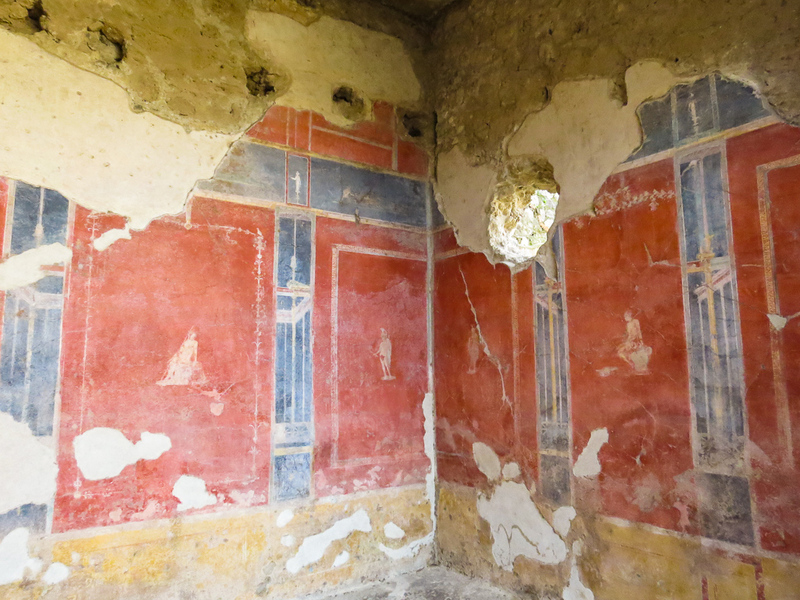 The houses are much more lavish, including that of a famous villa located here: Villa of the Papyri. The villa was rather extensive and also included a library! It may not seem too exciting, however this library is the only one to survive intact from antiquity. The inhabitants worshipped above all Hercules, who was believed to be the founder of both the town and Mount Vesuvius. Other important deities worshipped include Venus and Apollo, who are depicted in multiple statues in the city. 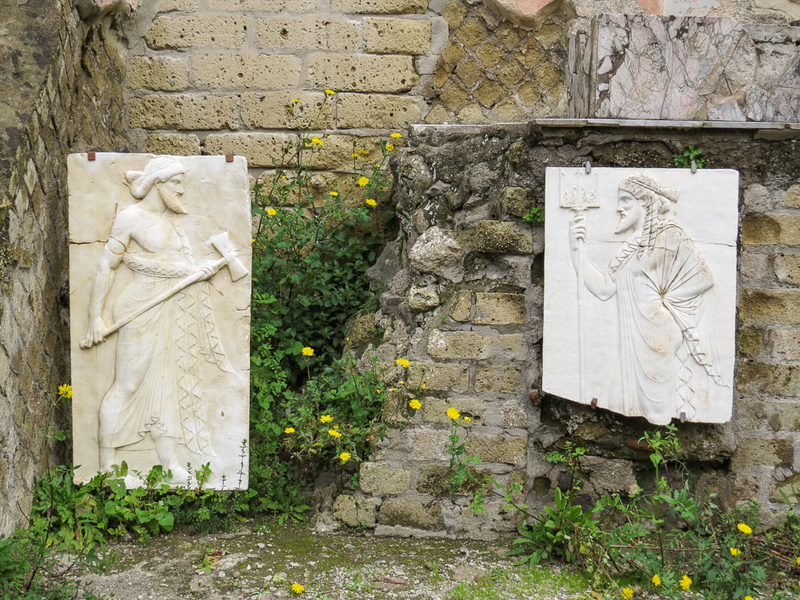 The great thing about Herculaneum is that gives you a sense of history, archaeology and myth is a relatively small space. 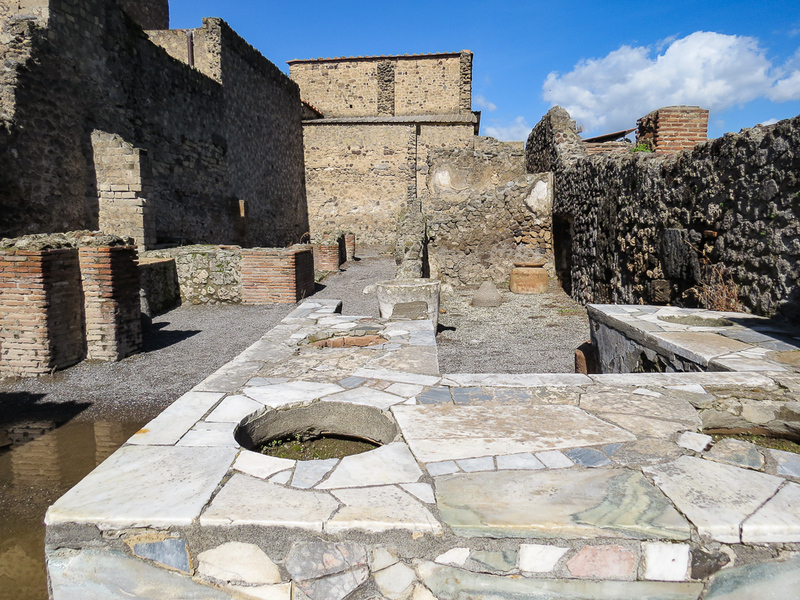 Yes, Herculaneum is a whole lot smaller than Pompeii, so it is much easier to explore. 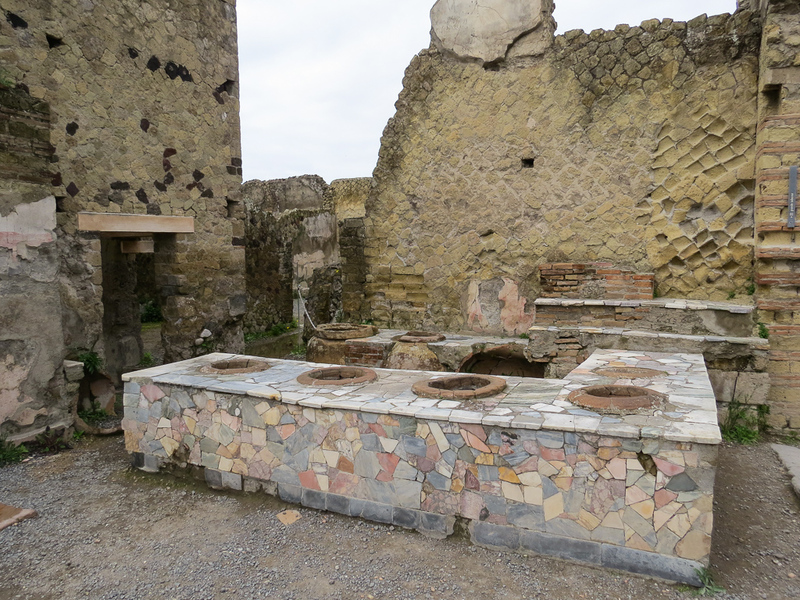 You can actually discover the whole, whereas in Pompeii you inevitably need to skip some bits. 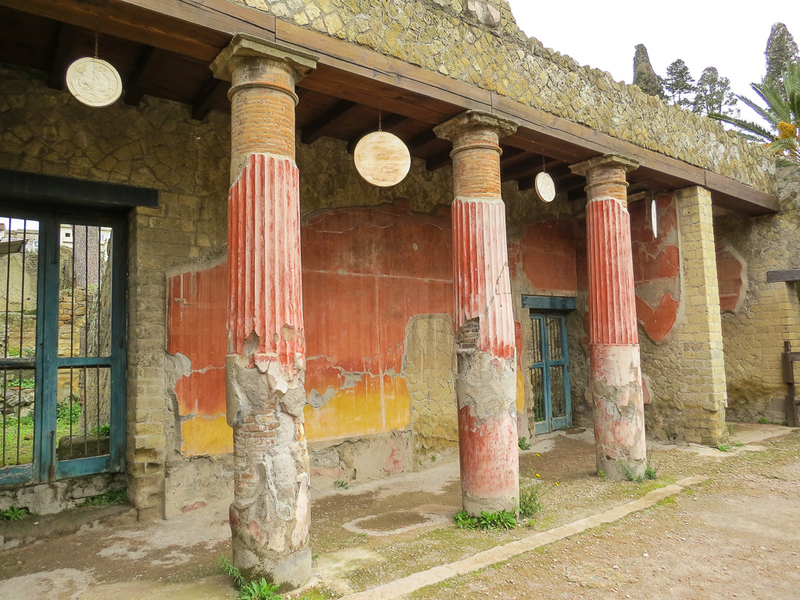 Herculaneum took us 2-3 hours, whereas Pompeii was 5-6 hours as I mentioned above. Don’t miss out on Pompeii’s lesser known neighbour! And there you go! Three epic day trips from Naples that you cannot miss out on. There are several other trips to take as well, but these were my favourites. That’s all, folks! This wraps up coverage of my trip to Italy in early 2018.